This recipe is one my mum taught me, something I grew up on. Now I have been making this myself for years and my family absolutely love it also. 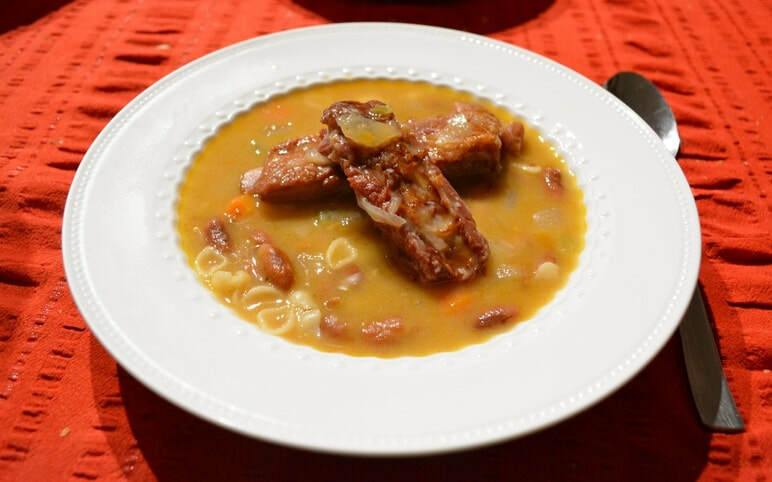 You can use either 2 smoked pork ribs, 1 ham hock or 1 ham bone, all work just as well as the other, giving you a beautiful, thick, hearty soup. Step 1. only needs to be done if you are using Smoked Pork Ribs or a Ham Hock as they can be rather salty. You do not need to do it if using a Ham Bone. With the beans I sometimes add half red kidney beans, half borlotti beans. Try not to forget to soak the beans for at least 8 hours, but if you do, follow the recipe below. But it is always better to soak them first, they cook quicker. Put the smoked ribs in a large saucepan (cut them so they can fit in the pot). Top with cold water and bring to the boil. Simmer for 5 minutes, drain. Place ribs on a plate until needed. If you forgot to soak the beans, or only soaked them for a short time, do this now, if you soaked the beans, disregard this step and go to the next step. In the same saucepan add the red kidney beans, cover with cold water, bring to the boil. Simmer for 5 minutes, drain. By doing this step you don't have to soak the beans in water for hours before cooking them. 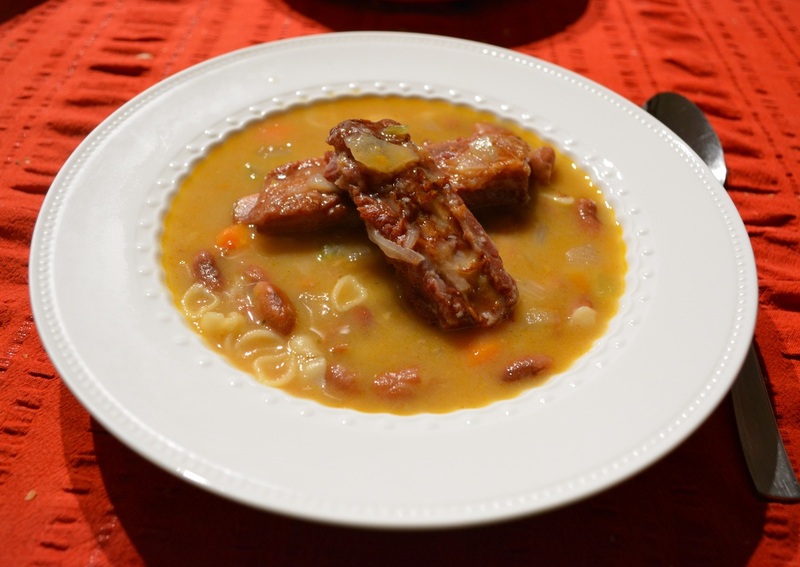 In the same saucepan return the ribs and beans, add the onion, carrot and celery. Fill the saucepan with cold water, bring to the boil, add vegeta, pepper and a little salt (don't over salt now as you don't know how salty the ribs are, you can always season near the end of cooking, once you have tasted the soup). Simmer for approximately 1 1/2 hours or until the beans are cooked and the meat is coming away from the rib bones easily, start checking after 1 hour. Make the zaprzak: This thickens the soup. In a small frying pan, add the oil, flour and paprika. Fry over a medium heat for a minute. If it looks really dry add a little more oil. When done add 1-2 ladles of cold tap water to the zaprzak, stir well then add the zaprzak to the soup. Simmer for 10 minutes. Add the shell pasta, cook until the pasta is just cooked. Taste and season with salt and pepper, if needed.